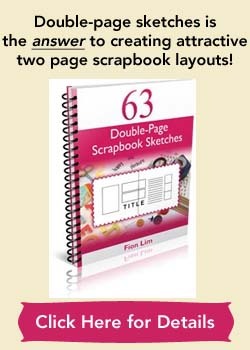 This scrapbooking idea is one that requires you to do some mind searching. :) Think back to when you’ve received a wonderful dose of good old advice from someone or anyone that proves to be invaluable as you go through life. Some of these advice could even be life-changing advice, altering you and your ways of doing things and eventually bringing changes to your life. These are words that’s likely to stay with you for a long time. But in case you ever do forget, you’ll have this layout to remind you! You can choose to focus entirely on one strong piece of advice that you’ve sworn living by. It could be a collection of random advice you’ve collected from various people over the years. As I see it, not only is this a great reminder to yourself but years later, your children or grandchildren could mull over their mom’s or grandmother’s record of wise words. For me, I’ve listed down three pieces of advice or wisdom I’ve collected. The first is direct advice from someone I’ve met, while the rest are quotes that I derive benefits from even if I’ve never met these wise people before. Advice is good only if we could digest it and live by those words. 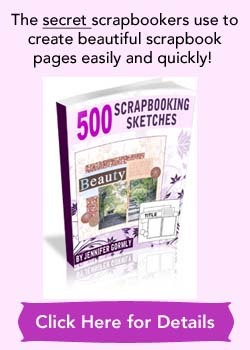 Scrapbook them and enjoy! 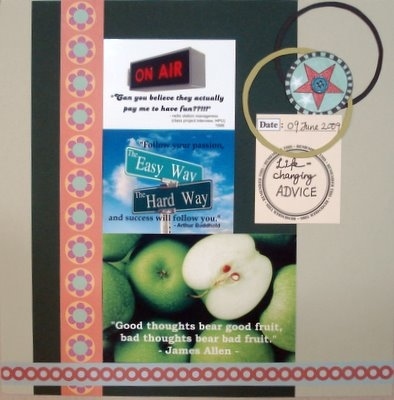 Photo Credits: “On Air” sign – David Humphrey, Sign that reads “Easy Way, Hard Way” – Melissa Dockstader, Green Apples – Sergei Didyk, all from Shutterstock. Supplies used: Cardstocks – Bazzill Basics, Patterned papers – Brenda Pinnick Designs “Paper Confections”, Scrapbook Walls “Holiday Fern”, Prima Marketing “Dude Collection – Star Quality”; Journal paper – Teresa Collins “Journal-it”, Black pen – Zig Memory System “Millennium”, Blue button – from stash.